Even people who use their ovens to store pots and pans most of the year, start pulling out their mixers and baking sheets about now. It’s cookie time and we’re lucky that an early Thanksgiving gave us a little extra time to fill our freezers with homemade treats for the holidays. I’m a self-confessed cookie addict. When I just checked, I found 14 cookie recipes posted here in the four years I’ve been writing this blog. Still, I’m always on the lookout for simple offerings that deliver irresistible flavor without a lot of fuss, especially during such a busy season. Bar cookies are one of the best bets. You spread them in the pan, bake, and slice when cooled. No rolling, no cutting, no decorating. They’re the perfect candidate to fill out a holiday cookie platter. I’m so enamored of the bar concept that I posted this gooey, over-the-top chocolate and dried cherry rendition in 2010. 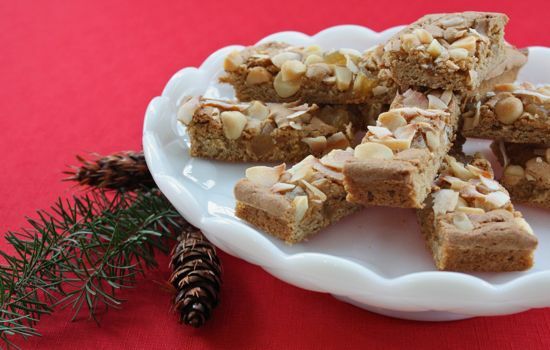 This year, I’m hoping to bring a little taste of the tropics to the wet and chilly Pacific Northwest with these fruit and nut bars. Loaded with dried pineapple, macadamias and coconut, they combine the chewy and crunchy textures I love with the bright flavor of pineapple and the subtle spice of brown sugar. They’re based loosely on the chocolate and walnut Congo Bars in Margaret Fox’s classic “Cafe Beaujolais” cookbook (Ten Speed Press, 1984). An unconscionable amount of dark brown sugar gives them a wonderfully moist, chewy character. I’ve introduced whole wheat pastry flour – currently my favorite basic baking ingredient – as well as the pineapple, macadamias and coconut flakes. You don’t really need to use a mixer to make these cookies, they’re so foolproof. But I always do. The only challenge here is to avoid eating all the cookies before the holiday parties begin. You could freeze them. Or just whip up another batch when you need them. They’re that easy. Preheat oven to 325 degrees. Line 10-by-15-inch rimmed cookie sheet with heavy duty aluminum foil, leaving a tail at each end for easy lifting. Butter generously. In a small bowl, stir together flour, baking powder and salt with a wire whisk. In large bowl, cream together butter, brown sugar and eggs until well blended. Stir flour mixture into butter mixture until thoroughly incorporated. Spread dough evenly on bottom of prepared cookie sheet. Scatter even layers of pineapple, macadamias and coconut over dough and press in lightly. Bake for 30-35 minutes, until lightly browned. Remove from oven and cool on wire rack. While still slightly warm, cut lengthwise into 3 pieces and across in 12 rows.